Folks, if you would like to do some year-end tax-deductible charitable giving that actually saves lives of children in poor countries, check out Pure Water for the World. They install organic water filters in homes and train volunteers locally to help people maintain their water filters. The recipients pony up a week's income (on average) to get the water filter, so it's not seen as a free handout or entitlement and it's dearly valued. Bad water is a big cause of death among infants and elderly people in countries like Honduras and Haiti. My wife and I gave some last year and then again this year to this organization after I studied their IRS 990's and visited with a number of board members to make sure they were legit, unlike so many of the non-profits out there asking for money when so little of it goes to the actual cause. Last edited by RandallNeighbour; 12-15-2015 at 10:44 AM. Bump for some worthy, year-end charitable giving. Its good that you verified the legitimacy of this organization because there are many that are so inefficient your dollars mostly go to pay administrators salaries, with little making it to the recipients. If the drought continues in Calfornia I may need some of those filters myself. Do they help people in the US as well? Hopefully those filters don't cost a week of my salary as well. I work for a water utility and there are plans underway for directly utilizing treated sewage and reintroducing it into the drinking water supply with appropriate extra treatment of course. People probably don't realize that we are already pumping treated sewage water back into the ground to recharge the wells where we get the drinking water from, so you are already indirectly drinking the fruits of your communities flushes in the southwestern US. On the subject of charities there are also the do gooders in the inefficient organizations that don't understand what the people they are trying to help really need. 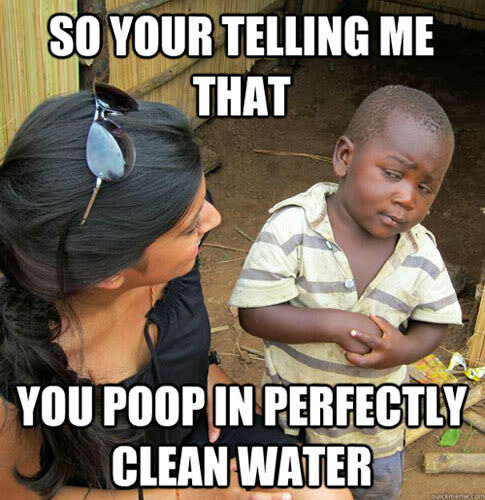 One organization built a well in Africa with high volume pumping capacity so it could server multiple villages and they also built a paved road to connect many communities that were to use this water supply. After checking back, they had drained the aquifer so the well went dry and since their animals that were to haul the water to distant towns did not have horseshoes their hoofs were injured on the paved road and they could not use the road anymore. The road was used for drying dung for fires and clothes instead. The towns are back to the old water sources and stay off the paved road now but they can boast to other villages that they have their own autobahn. Moral of that true story is to research the organizations and be selective/smart with your donations. I feel better, nothing like a good rant in the morning to clear the mind. Last edited by jb92563; 01-13-2016 at 06:01 AM.